Draft: 2016, Kansas City Royals, 10th rd. Full name is Richard Tyler Lovelady…resides in Midway, Ga., during the offseason ... Graduated from First Presbyterian High School in Macon, Ga., in 2013 ... Attended both East Georgia College (2014-15) and Kennesaw State University (2016)…in his lone season at KSU, went 4-2 with a 2.96 ERA and 52 strikeouts in 45.2 innings…his 37 appearances were the second-most in program history. Named Omaha (AAA) Pitcher of the Year, his second straight pitcher of the year award, also winning in Wilmington (A+) in 2017…also tabbed the Paul Splittorff Pitcher of the Year, which recognizes the top pitcher in the organization ... Spent the entire year with the Storm Chasers, going 3-3 with nine saves and a 2.47 ERA (20 ER in 73.0 IP) in a career-high 46 relief appearances ... Ranked second among Pacific Coast League relievers with a .204 opponents' average (53-for-260), which included holding opponents to a .147 average (14-for- 94) after the All-Star break ... 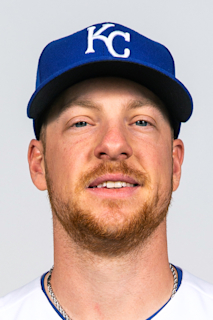 Allowed just three home runs the entire season (0.37 HR/9), including a 41.0-inning homerless streak over his final 24 outings (June 14-end of season) ... Held left-handed batters to a .157/.224/.258 (14-for-89) slashline, with just six extra-base hits (4 doubles, 1 triple, 1 homer) ... During a 14-game stretch (June 14-Aug. 2), allowed one earned run over 27.0 innings (0.33 ERA)…held opponents to a .148 batting average (13-for-88) in that period ... Recorded six outs or more in 22 of his 46 outings, including in four of his nine saves ... Finished the year as the club's No. 13 prospect according to MLB.com Pipeline. Split the season between Wilmington (A) and Northwest Arkansas (AA), making 21 appearances at each stop… combined to go 4-2 with a 1.62 ERA (12 ER in 66.2 IP) with 10 saves in 14 chances... Named Wilmington Pitcher of the Year as well as a MiLB. com Organization All-Star…selected to the Carolina League All-Star Game, tossing a scoreless eighth inning for the North Division... Made 15 consecutive scoreless appearances (May 7-June 30), which spanned 25.1 innings…he did not allow an unearned run over 19-straight outings (May 7-July 14)... At Wilmington, allowed just four walks and recorded 41 strikeouts in 33.1 innings (1.08 BB/9; 11.07 K/9)... Collected a career-high five strikeouts in an outing three times - June 8 vs. Buies Creek and June 13 at Lynchburg with Wilmington and Aug. 8 vs. Midland with Northwest Arkansas... Between his two stops, held left-handed batters to a .184 average (14-for-76) with just three extra-base hits (all doubles)... Allowed a season-high three earned runs on July 28 vs. Springfield…then allowed three earned runs over his final 12 appearances with the Naturals, spanning 18.2 innings (1.45 ERA). April 9, 2019 Kansas City Royals selected the contract of LHP Richard Lovelady from Omaha Storm Chasers. January 8, 2019 Kansas City Royals invited non-roster LHP Richard Lovelady to spring training. April 2, 2018 LHP Richard Lovelady assigned to Omaha Storm Chasers from Northwest Arkansas Naturals. January 5, 2018 Kansas City Royals invited non-roster LHP Richard Lovelady to spring training. June 26, 2017 LHP Richard Lovelady assigned to Northwest Arkansas Naturals from Wilmington Blue Rocks. April 5, 2017 LHP Richard Lovelady assigned to Wilmington Blue Rocks from Idaho Falls Chukars. July 28, 2016 LHP Richard Lovelady assigned to Idaho Falls Chukars from AZL Royals. June 21, 2016 LHP Richard Lovelady assigned to AZL Royals. June 20, 2016 Kansas City Royals signed LHP Richard Lovelady.